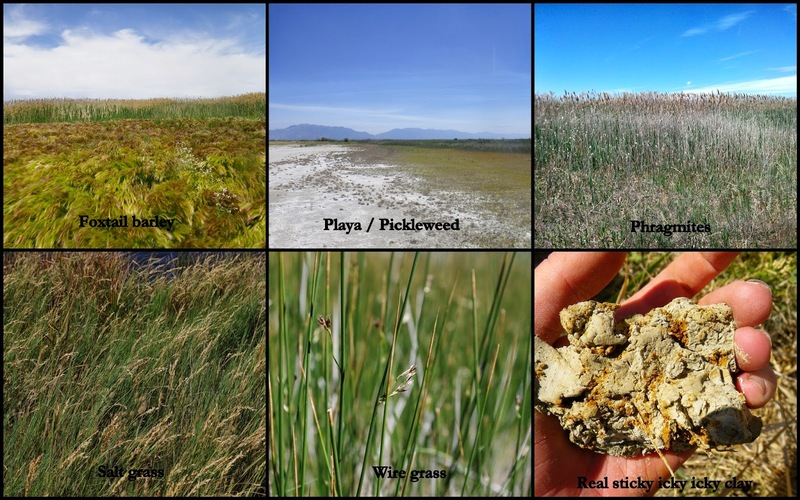 I’d like to start this blog off with a tale of the biggest fail moment in my PhD – the time I lost the key to the field vehicle in the wetlands of the Great Salt Lake (GSL). I lost this key early in my PhD project at the point where I was being disappointed frequently by the realistic-ness of my plans, but this failure in particular has haunted me for the last three years. There are some important lessons I learned from this experience that I’ll share up front, in case the details of my failure are too painful or tedious. 1. Field days are for field work only, don’t schedule anything else. 2. Don’t take anything into the wetlands that can’t be covered in mud. 3. Bring water with you into the field. I wish I could begin this tale with “everything started out according to plan…” but that would be a lie. The goal of my PhD project is to better understand the impact of impoundment and water management on wetland structure and function. To answer this I selected 50 wetlands from the eastern shore of GSL to monitor for four years. When I formulated my research question and the plan to survey 50 sites every summer I was feeling ambitious and excited to start field work. By June 15, 2012 I had come to regret all my life decisions that had led me to Ogden Bay WMA. The wetlands I selected were chosen from maps put together in the late 1980s that might never have included reasonable wetland boundaries, some of the wetlands weren’t wetlands anymore, and the land owners only sometimes responded to emails or letters. I had decided to use piezometers – wells with a data logger inside that automatically records the water depth all year long – installed at a subset of sites to monitor the hydrology at my sites and thought it was a pretty slick plan. I had worked with piezometers before but had never actually put one together, which presented even more trouble primarily because I refused to ask simple questions like “How do you put a lid on these things.” After much unnecessary suffering I was finally ready to install my piezometers – I’d gotten access to my sites, the piezometers were assembled and I had a wonderful technician to help me out. On June 14th we’d successfully installed three piezometers, so it was reasonable to think we could get four installed on the 15th. But first I needed to have a meeting with a funder to ensure that I was fully distracted. I didn’t get to the lab until 12:00, so we didn’t head out until the afternoon for the 55 mile journey. The hour long drive to the parking for site OBU03 didn’t do much to calm my nerves and I basically jumped out of the car, thinking if we packed up in a hurry it might make up for the hour long meeting I’d scheduled. I did the usual turn around in circles trying to make sure I had everything before heading off on the half mile hike from the parking lot to our site (auger √, well √, sand √, datasheet √, camera √, water , key ?….). I like to think that without the hours lost to the meeting before field work and the ambitious schedule I’d put together for the day perhaps I’d have suggested one of the two of us bring water. I did notice the other car in the parking area behind the locked gate we’d just passed through and decided our key was one of the things we should take with us because our car just might get stolen by the one other person back there. But there was no time to put the key some place safe, there was a piezometer to install, so I started our hike with the key in my pocket. The hike across the wetlands to site OBU03 was pretty delightful. There was a field of foxtail barely we stopped to admire, playas with nice short pickleweed, a wall of Phragmites to avoid hiking through, and an easy path through the lush salt grass. The piezometer was installed with minimal trouble, there were a lot of iron redox concentrations in the very sticky clay (“real sticky icky icky” according to subsequent field crews) that contrasted nicely with the wire grass around the site, but nothing else noteworthy. As we stood to leave I noticed there was no key in my front pocket. “It must be in the backpack,” I told myself, but there was some doubt in my mind. The hike back to the car was slightly less carefree because the wind had started really blowing and I wasn’t entirely sure I’d actually find the car key in my backpack. Just as we reached the car and I figured out the key definitely wasn’t in my backpack our coworker called about meeting up and I had to admit for the first time that I had lost the key to the car somewhere in the half mile of wetlands between the car and the piezometer. We now had the choice of either giving up and sitting to have a cry or looking for a 2-inch by 1-inch electronic key lost somewhere over the course of a 20-minute hike. 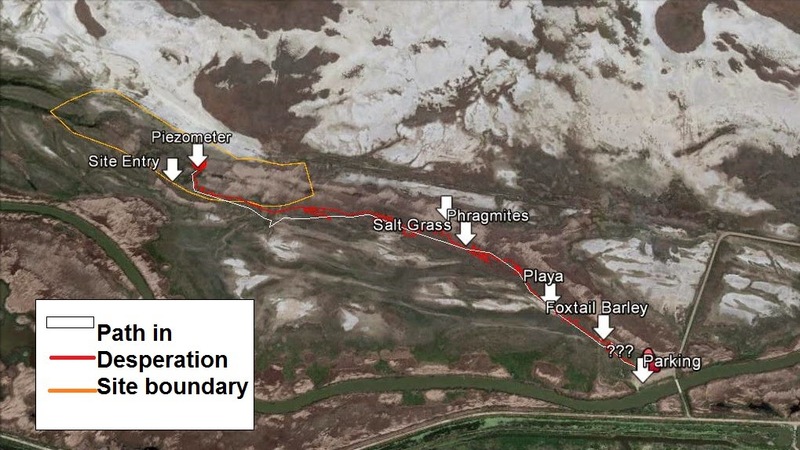 We tried our hardest to re-create our original path through the foxtail barey, angling across the playa at a 293º angle, along the salt grass next to the Phragmites, finally into the site through the gap in Phragmites*. When we got to the site we spent at least 10 minutes patting down the wire grass (I know now why it’s called wire grass). I was sure if I pushed my fingers through the grass one more time near the spot I was sitting I’d find the key, but with each poke the disappointment killed 0.07% of my soul. I couldn’t let a significant chunk of my soul die this far ahead of actually trying to write my dissertation so we gave up on the site but continued looking on the hike back to the car, sure we’d find it. We bent down to poke the ground every place I might have tripped on a root or plants might have touched my legs or anywhere that looked a little darker than the surrounding vegetation, all the while my soul died more as my panic really started to rise. How were we going to get out of there? Would we die first? Lesson 3 – Take water with you into the field. We got back to the car two hours after we originally left only to gaze through the window at our water locked there in the car beyond our reach. Dehydrated and distraught, I had to call for a rescue, which involved three separate phone calls and pleas for help yelled over the howling wind. First I called our co-worker who runs the Wildlife Management Area to beg for water. Next I called my advisor to admit the loss of the key and ask for a rescue with the spare key in her office. That just wouldn’t work, given her schedule and how far out of the way this place was. Before we disconnected Dave suggested she point the electronic key at her cell phone and press “Unlock” while I pointed my phone at the car, it’s an idea we’d all heard and it seemed worth a shot. It doesn’t work, the jerk that started that myth is a jerk. Finally I called my boyfriend on the chance he could leave work, get the spare key from my advisor and then drive to Out-Of-the-Way, Utah to rescue me. He could and did, but having to ask so many people for help represented a real low point in my studies. As we waited for our coworker with the water I had lots of time to think about just how dumb it was to put the key in my pocket. I knew you shouldn’t take things that can’t get muddy into the wetlands, that includes things that will hide easily in the mud. I ranted a little bit about how lame the pockets on women’s pants are, even the work pants (super lame), but this was entirely preventable and I was the one who could have prevented it. Lesson 4 – Appreciate your people. Despite my serious screw up there are some hero’s in this story. First is our phenomenal technician who was willing to literally carry around the 50 lbs of sand required to install a piezometer without complaint and dealt with inevitable mishaps with a positive attitude. To this day, when I run into troubles in the field I think “What would Dave do?” and the answer is never that he would sit down and cry. Second, our co-worker who brought the most amazing water either of us would ever taste, a two-liter bottle of ice with a smack of leftover root beer. Mmmm, it’s never gotten better than that water on that windy day. Finally, my boyfriend who was willing to interrupt his work day for a three-hour drive to come save me. Having to ask for a rescue is unpleasant but it provides an opportunity to recognize the people who help me out physically and emotionally in this silly scientific process. I suppose this is all just a way to reiterate the General Rule of Field Work (otherwise known as Murphy’s Law): what can go wrong will go wrong, deal with it. *You may be wondering why there is so much detail here, it’s because I re-create that walk three times every year, still looking for the key. 2015 may be the year I find that silly thing.